b. 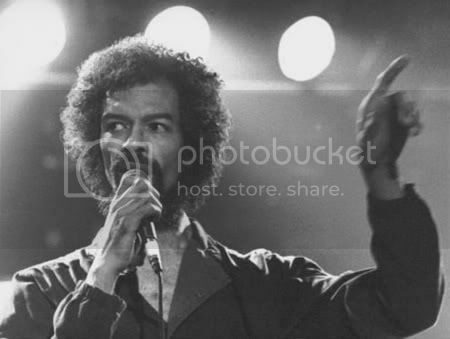 1st April 1949, Chicago, Illinois, U.S.A.
Born in Chicago in 1949, Gil Scott-Heron became one of the inspirators of Rap Music. With very much of a political viewpoint, Gil became a mouthpiece for the Black Person in America during the Seventies and Eighties. Gil was the son of a Jamaican professional soccer player and a college graduate mother who worked as a librarian. His father played for the Scottish football side, Celtic. Both parents divorced whilst Gil was still a child and he was despatched off to his grandmother in Lincoln, Tennessee. His grandmother helped Gil musically, however, early racial tensions at school, in Jackson, led him to relocate again to the Bronx during his adolescent years to live with his mother and he later moved again to the Spanish neighbourhood of Chelsea. At the age of 13, Gil had already written a book of poetry. Gil attended college in Pennsylvania and then left to concentrate on writing his first novel entitled 'The Vulture' in 1968. It was at college he met Brian Jackson, who was later to be a long time musical collaborator. He released his debut album, 'New Black Poet: Small Talk at 125th and Lennox', in 1970, the title of which was influenced by a piece of poetry written by his mentor, Bob Thiele. The album contained the powerful 'The Revolution Will Not Be Televised', a damning political attack on the media and the treatment of Black People in the U.S. The follow up album, 1971's 'Pieces of a Man', showed a growing musical maturity, featuring 'Lady Day and John Coltrane' and the, less political, 'I Think I'll Call It Morning'. Gil was under Bob Thiele's (who had originally influenced Gil to record back in the late Sixties), Flying Dutchman Records umbrella until the mid-'70s. il signed a one album deal for the Strata East imprint, out of New York, in 1974 with Brian Jackson, and released the album 'Winter In America', which contained the original version of 'The Bottle', along with 'Peace Go With You, Brother'. They had an instant hit with the song 'The Bottle', a track highlighting the misuse of alcohol. and probably the highpoint of Gil's career, reaching number 15 on the R & B charts. Gil then was signed to the Arista label in 1975. Here Gil received instant success with the South African diatribe, 'Johannesburg', a song that reached number 29 on the R & B charts that year. His first two albums at the new label were 'First Minute of a New Day' (containing 'Winter In America', again, and 'Ain't No Such Thing As Superman') and the album 'From South Africa to South Carolina' (containing 'Johannesburg'). 1976 saw the release of the double album 'It's Your World' which contained the live version of the track 'The Bottle' and was recorded live at Paul's Mall in Boston, Massachusetts in July of that year. Gil's band at the time were, the Midnight Band, who were mentioned in the song 'Race Track In France', taken from the album 'Bridges' in 1977, again a collaboration with Brian Jackson. That album also spawned the popular 'Hello Sunday, Hello Road'. By 1978, Brian Jackson had his final association with Gil, seeing Malcolm Cecil then taking over the musical direction, following the release of the album 'Secrets', that featured the the drug related song 'Angel Dust'. 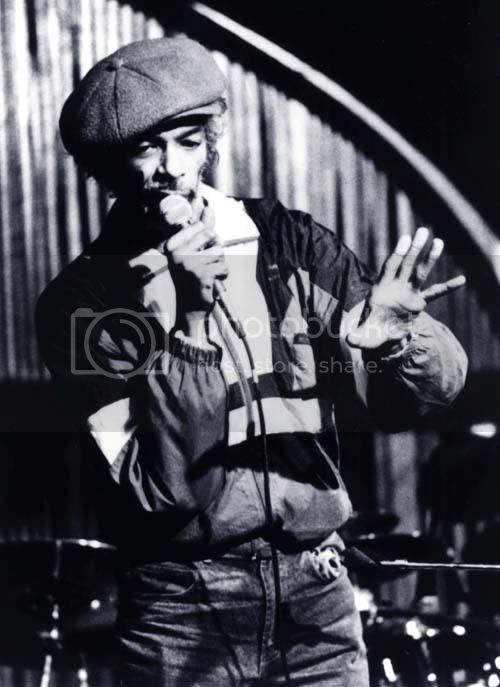 That same year, Gil released an album of poetry and music, entitled 'The Mind Of Gil Scott Heron' for Arista Records. By the turn of the decade, Nile Rogers (from the group Chic) had been recruited on production chores. 1980's album, 'Real Eyes' contained the excellent 'A Legend In His Own Mind'. The same year saw the album '1980' hitting the streets (featuring the songs 'Shut Em Down' and 'Angola, Louisiana'). In 1981, the album 'Reflections' was released, featuring 'Is That Jazz' and 'Gun' (an impressive attack on the U.S. gunlaws, a subject later to be highlighted in the Michael Moore movie vehicle 'Bowling For Columbine'). By 1982, the excellent 'Moving Target' saw the light of day. This set contained the excellent 'Fast Lane' and 'Washington D.C.' Gil turned on, the then President, Ronald Reagan, and began criticising the election of an ex B-Movie actor in the role of the most powerful man on Earth. 'B-Movie' became a song, as did 'Re-Ron', highlighting Gil's further political awareness. By 1985, Gil had left the Arista imprint and he began touring. In 1990, a retrospective double album was released entitled 'Tales Of Gil Scott-Heron And His Amnesia Express'. He also released a pseudo 'house' twelve inch single entitled 'Space Shuttle'. In 1993, Gil signed to the TVT Records label and released the album, 'Spirits'. In 2001, Gil was imprisoned by a judge in New York, for one to three years following a failure to deal with a persistent drugs problem. He continued to have problems with drugs throughout the decade, and was in jail again from 2006-2007. In 2010, Gil Scott-Heron released his final album "I'm New Here", a collaboration with British producer Richard Russell. He died in New York City on May 27th, 2011. "No Nukes" (various artists, 1979) - includes live "We Almost Lost Detroit"
Ron Holloway - "Scorcher" (1996) - GSH on "Is That Jazz" and "Blue Collar"
Ron Holloway - "Groove Update" (1998) - solo album by GSH saxophonist, GSH guest vocals on "Three Miles Down" and "We Almost Lost Detroit" versions. 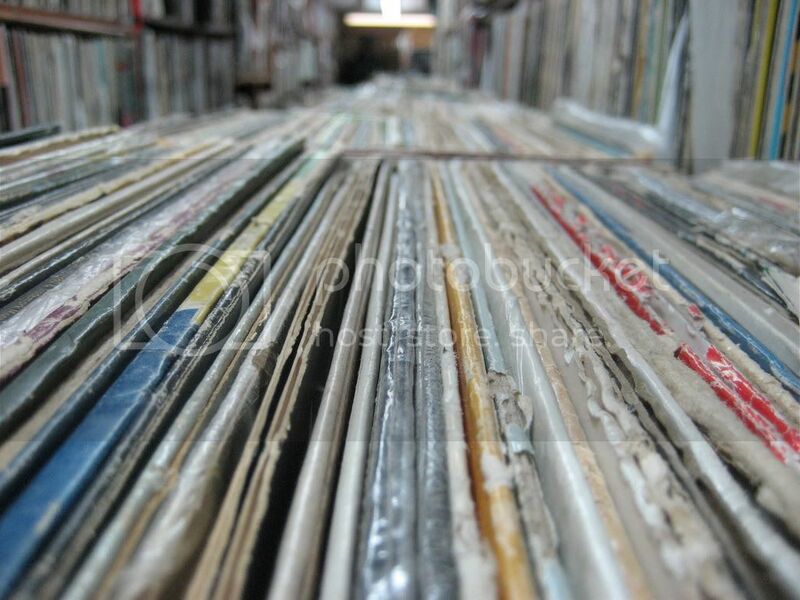 Brian Jackson - "Gotta Play" (2000) - GSH on "Parallel Lean/Home is Where the Hatred Is"
Blackalicious - "Blazing Arrow" (2002) - GSH on "First in Flight"
1974-1984 tracks on Arista Records. The only album with "Re-Ron" , which was a 12"-only release.